Do we know what the impact is to base scores from the Prestige upgrades? Like, how much turrets add, or reinforced factories or barracks? Will we see people upgrade just the credit markets and alloy refineries to add hit points, but minimize base score increases? I’ve already done some of the bigger impact items and almost gotten the two new turrets to L9... This is one of those questions I didn’t ask before jumping ahead. The words of Yoda should remind us,: once you start down that path... forever will it consume you. Maybe the future he could see? 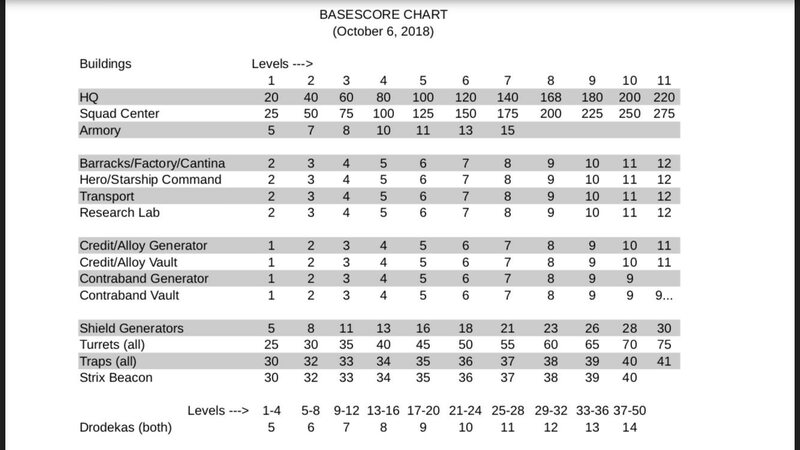 DesertPyramid wrote: Do we know what the impact is to base scores from the Prestige upgrades? Like, how much turrets add, or reinforced factories or barracks? Will we see people upgrade just the credit markets and alloy refineries to add hit points, but minimize base score increases? When I started a mini base to see the impact of any item to base strenght, I always checked the ksod site to see the how much each new upgrade added to my base, like a new turret adding 25, or a shield upgrade adding 3, for example. Then I kept my 2 turrets at level 1, and upgraded all shields to max level. There's nothing in the game saying you need to upgrade everything, but only what you think you really need. We saw in other thread that upgrading everything to Prestige can be a big mistake you can't undo -- case of Barracks with the increase in crystal costs to rush units. Keep one barrack/factory at 10, it's a good tip. Why upgrading Refineries and Markets to Prestige? Or Traps, except the IDT/LAAT? If you play wars, everything you can upgrade will help your base to survive, but if you're worried about PvP and how these new upgrades will increase your BS, upgrade only what you think you will need for now. At last, my 3 Unit Transport are ready. 1 barrack upgrading to Prestige....until next sunday.. Some of those new prestige buildings look really hot. Especially the transports. The guy/girl who did the models really brought their A-game. why my A-A5 samples are not prestige like AT-DT - jugg - HF? JARJAR wrote: why my A-A5 samples are not prestige like AT-DT - jugg - HF? JARJAR - Currently the Rebel A-A5 Speeder Truck (and Empire Imperial Troop Transport) do not have a Prestige Level. This is to be expected to be corrected at some point.